How good are you in reading if the text is turned upside down? 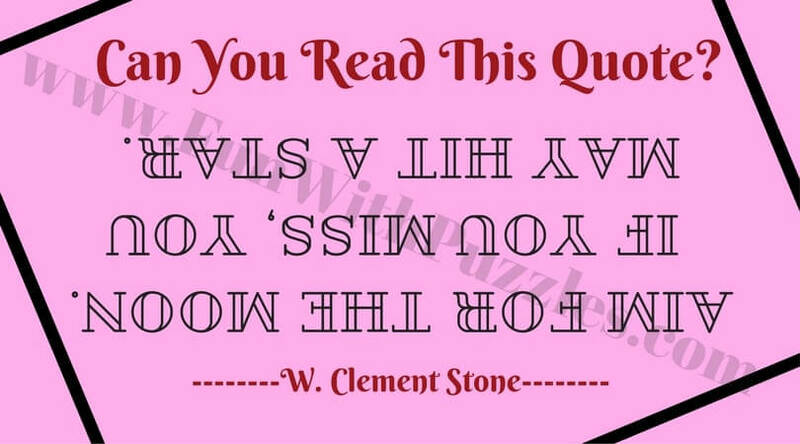 There are many reading challenges on this website where one has to read backward, read scrambled words, read encrypted text or has to read the hidden letters. 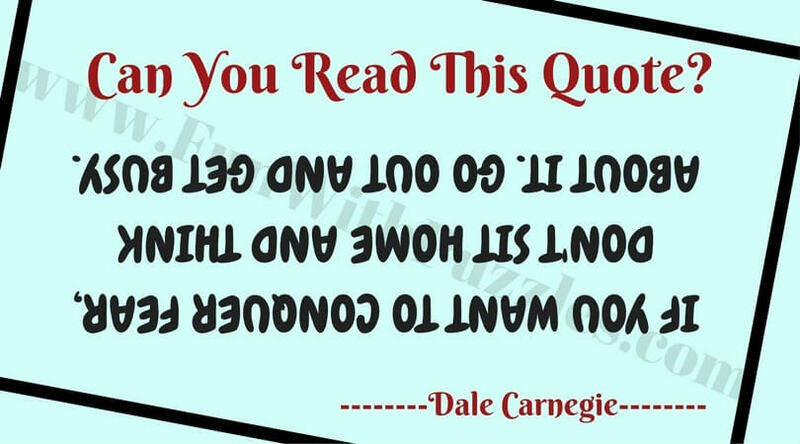 Different people are comfortable reading different challenges e.g. some people can easily read backward but will have some challenge in reading scrambled words and vice versa. 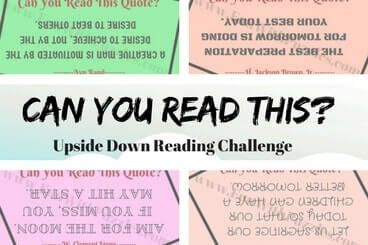 Here is upside reading challenge. Can you take this reading challenge? 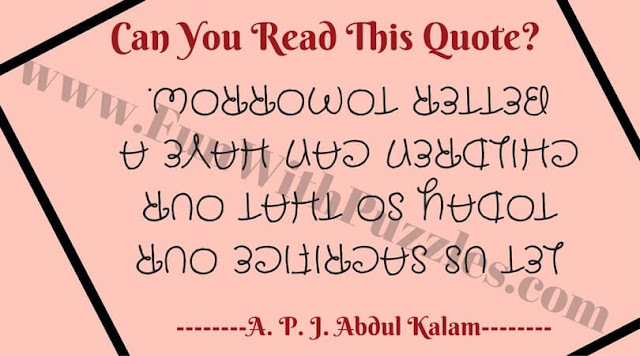 In these upside reading challenge, each of the given puzzle picture contains one quote by famous personality which has to turned upside down. 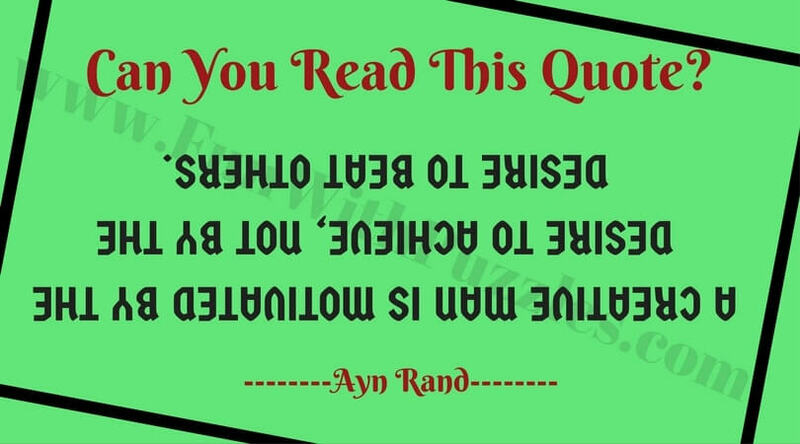 Your challenge is to read these quotes upside down as fast as possible. 1. Can you read this quote by Dr. A. P. J. Abdul Kalam? 2. 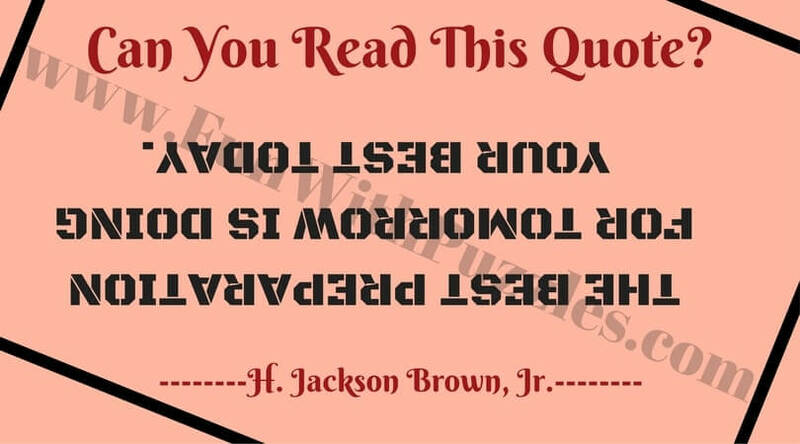 Bottom Upside Reading Challenge. 4. Can you solve this reading Challenge Puzzle? 1. Finding Hidden Faces in the Given Pictures Brain Teasers: In these your challenge is to find the hidden face in the given picture puzzle images. 2. Fun Picture Puzzles to Test Your Observation Skills: These are the fun picture puzzles which will test your observational skills. In these fun picture puzzles you challenge is to find the hidden animals in the given picture puzzle images. 3. Hidden Face in Picture Brain Teasers: Get ready to shake your brain to find the hidden faces in the picture brainteasers. 4. Observation Skill Test-Counting Number of Squares Puzzles: This is another set of visual puzzles to test your observational skills. In these visual puzzles your challenge is to count the number of squares in the given picture puzzle image. 1. LET US SACRIFICE OUR TODAY SO THAT OUR CHILDREN CAN HAVE A BETTER TOMORROW. 2. IF YOU WANT TO CONQUER FEAR, DON'T SIT HOME AND THINK ABOUT IT. GO OUT AND GET BUSY. 3. THE BEST PREPARATION FOR TOMORROW IS DOING YOUR BEST TODAY. 4. A CREATIVE MAN IS MOTIVATED BY THE DESIRE TO ACHIEVE, NOT BY THE DESIRE TO BEAT OTHERS. 5. AIM FOR THE MOON. IF YOU MISS, YOU MAY HIT A STAR.